That’s how a lot of real estate agents operate their business or at least try to. 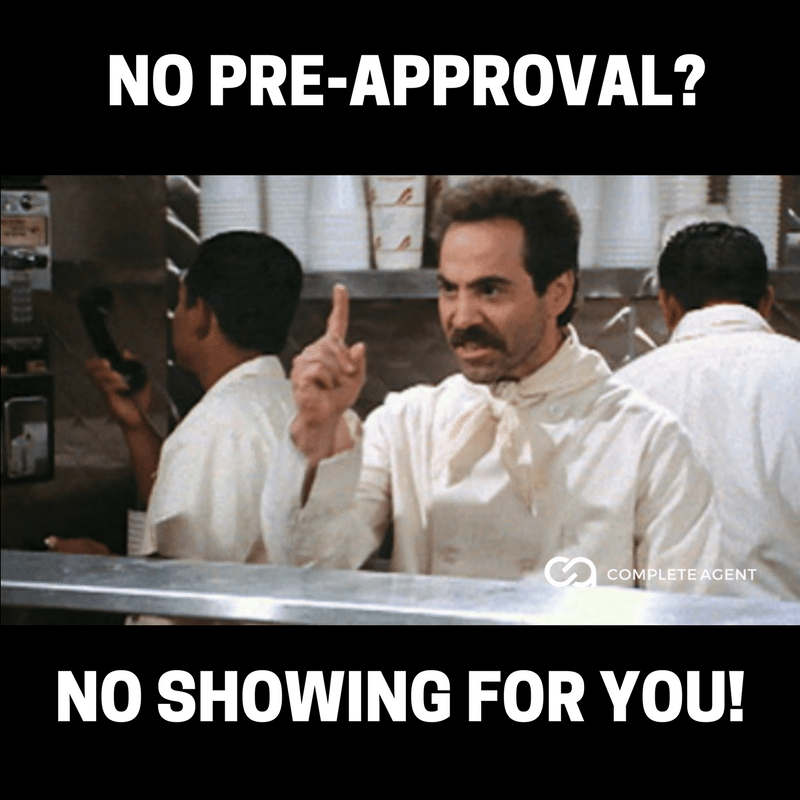 We’ve all heard of this practice, and we all feel a little guilty when we commit the treason that is taking a buyer to see homes without a pre-approval letter in hand. The reality is I’ve closed countless transactions with clients who I didn’t immediately twist their arm for a pre-approval letter, and we ended up having a buttery smooth transaction. Some of these people have become some of my loyal clients who continually refer me business. A common thread I hear from these people is that they frankly didn’t like or appreciate the condescending nature and tone that they felt from other agents they spoke to who wouldn’t give them the time of day without a pre-approval. Put yourself in the mind of a consumer who maybe has never either bought a house before or doesn’t remember having to fill out a credit application just to go see some houses. Sales is all about making people feel comfortable with you, and how can you expect someone to feel comfortable with you when you’re instantly distrusting? Which by the way, saying “Before we can go see this house you called about, we’ll need to confirm that you can afford it” is not the picture of trust. It’s just the worst way, in my opinion, to handle a new and interested buyer. I’m not saying that you shouldn’t be using your experience and spidey-senses to pre-qualify leads, but if you there aren’t too many red flags, go open some doors and make a connection with another human. When it comes to showings, you have to treat buyers like you’re on a first date. I’ll demonstrate in the examples below. Working with buyers is, in fact, a lot like dating someone. First showing (first date): Your first time meeting them in person is like the first date. This is where they see if the online pictures and persona match the real thing. Remember, you only get one chance for a first impression. Pre-approval (first kiss): Congratulations. If your buyer leads went through with getting pre-qualified with your lender, you made it to this stage. The home search (dating): Your relationship continues to grow while you’re working the buyers and searching for homes. The deal is not sealed yet, and you still need to show that you’re the right person they should be working with. Contract acceptance (the engagement): Now, they’re really committed! Congratulations, you did so well that they liked you enough to go under contract with you, but don’t forget that you can still get left at the altar. The closing (honeymoon): Now is the time to celebrate with your buyers, you made it to the closing table aka the honeymoon. Treat the first showing as the dinner date. We take every buyer lead out showing at least once even if we don’t have a pre-approval (usually show two to three homes). That’s actually our goal and has been for awhile because we found that, especially with internet leads, if we can meet them in person and spend an hour or two seeing a couple of homes, our conversion rate shot through the roof. Actually, not only did conversions go way up, but pretty much every key performance indicator that we were tracking increased dramatically as well; because when you show more homes, more offers get written, then accepted and then deals are done. What going out and meeting them face-to-face accomplishes is just that, a face-to-face meeting, which is surprisingly undervalued these days. Answer the call: Closers answer quickly with a smile on and a tone that exudes friendliness and confidence. This is the second first impression but even more important. Ask the right questions: One person is always leading a conversation, and one person always thinks they are. You know which one to be. Feel them out: Sales are as much a science as they are an art. Mirror their tone and energy. Probe a little further and engage them in conversation. Schedule a showing: Get face-to-face, and seduce them with your expertise and knowledge. Adam Yera is the managing partner of Re/Max Real Estate Associates. Follow him on Twitter.